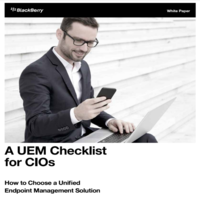 A lot of offices probably have them by now – that fellow worker who sports a Fitbit on her wrist, the guy with the Samsung Gear S or the one who ordered the Apple Watch online. The selection and sophistication of wearable technology available in the market continue to grow and these devices are rapidly showing up in the workplace. Many dismiss them as a pricey extension of smart phones, but a recent report from cloud computing giant Salesforce.com claims that enterprises that deploy wearables are reaping performance benefits from their staff. 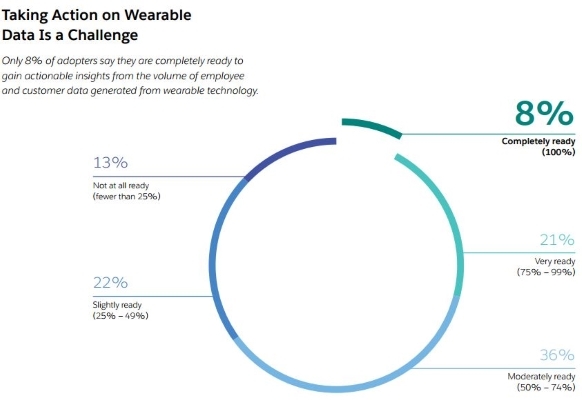 Salesforce wanted to determine: who are already using and who are planning to use wearables in the enterprise; the value and role of wearables in business and how it will evolve; which wearable types are having the biggest impact; and the common challenges firms face in deploying wearables. According to the study, 54 per cent of respondents were supporting a bring your own wearable program and another 40 per cent were planning to support the model in the future. 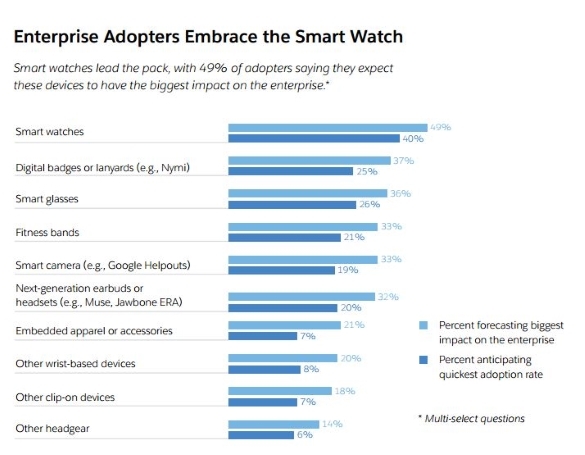 “Adopters are not only building apps and wearable devices themselves, but increasingly using wearable tech in their core business operations,” according to Salesforce. 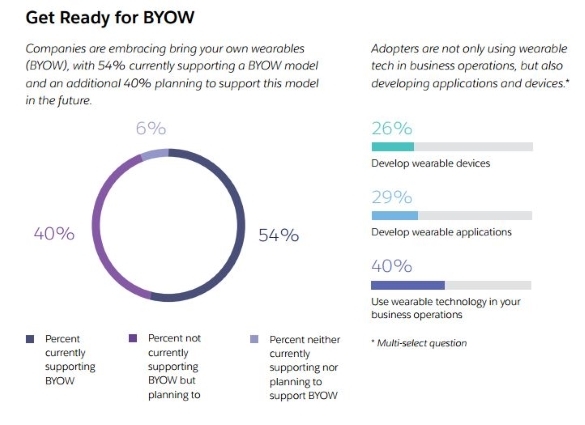 A large number of enterprise BYOW adopters (49 per cent) forecast that among wearable devices, smart watches will likely create the biggest impact on the enterprise. Applications such as Evernote, Invoice2go and Salesforce Wave are available for many wearable devices and enterprises expect to face increasing pressure to capture and to use data generated by wearable devices. 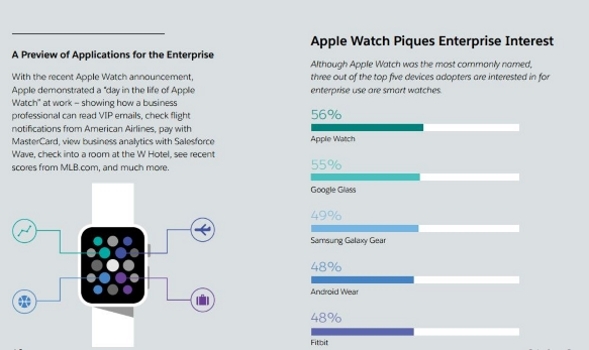 Salesforce foresees a surge in data coming from wearable technologies within the next three to five year. 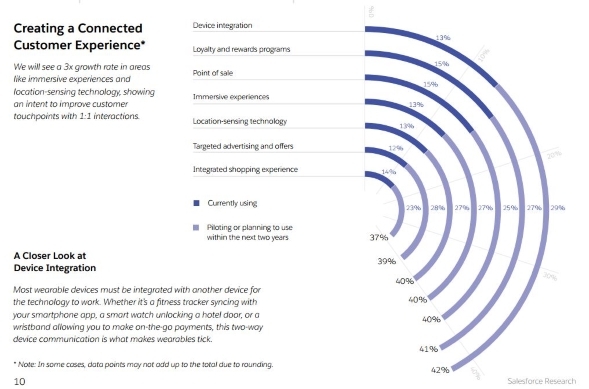 Organizations that are prepared to extract actionable insights from both company and customer data collected by wearable devices have the potential of becoming leaders in their sectors, according to Salesforce.